Plasma Ruggedized Solutions has recently developed Kronos-10™, a state-of-the-art underfill material. Kronos-10™ provides superior moisture and thermal cycling performance coupled with an extraordinary bonding characteristic that makes it invaluable for various shock and vibration applications. Kronos-10™ was developed to address the growing need for thermal dissipation of BGA, LGA and other like componentry that create and emit significant heat signatures. 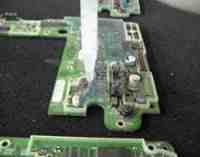 Left untreated such heat signatures from BGA’s LGA’s and other electronic devices may induce and transfer a heat load creating a significant CTE event to the PCB or neighboring electronics. The internal operational features of the PCB may become compromised resulting in an operational failure. When applied Kronos-10™ features a capillary flow property that completely encapsulates the components’ undercarriage, resulting in a combination of a superior heat dissipation mechanism while insuring the stability of the attachment of the component to the PCB. Given the fact that more and more military electronics are COTS products that feature lead-free solder and other materials not designed for various military theatres and environmental threats it is crucial to apply a product like Kronos-10™ to assure intended performance and system viability. In its cured state the specially blended features of Kronos-10™ create an adhesive bond well beyond the standards of conventional Underfills and other heat dissipative materials. In fact, the material was designed as a “System” to concurrently address heat dissipation and shock and vibration needs of the A&D, Medical, Oil and Gas and Industrial market segments. Kronos-10™ has successfully completed development and is available for sale. Contact Plasma Ruggedized Solutions for additional information. Contact Plasma Ruggedized Solutions or request a quote today to learn more about Kronos-10™, our state-of-the-art underfill material.